Mulching Sheets offered comes in quality construction finish and comprise nonwoven fabric fruit covering that meet the demands of quick, safe and better growth rate of the harvest. 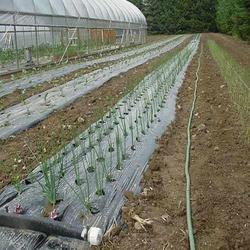 Further, it also supports the demands of protecting vegetables, plants and other sown crops from frost, snow, heat, and other damage possibilities.Some of its features include support increasing growth temperature and extend growing season; protect vegetables; provide for early and increased harvest output; easy to install. Looking for Mulching Sheets ?